IMPULS is an eco-friendly printing company. Our printing house has receive the prestigious environmental certificates FSC® and PEFC. 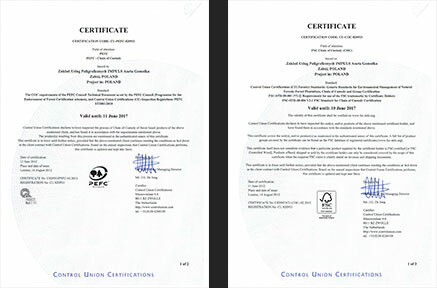 These certificates indicate that we supply in raw materials derived from properly managed forests, to comply with the highest social and environmental standards. Thus we meet the stringent requirements of foreign and domestic customers, who increasingly pay attention to ecological aspects of the business.